Sonam Kapoor has established herself as the ultimate fashion icon of Bollywood. From Bollywood red carpet events to Cannes Film Festivals to every public appearance, Sonam has stunned us each time. 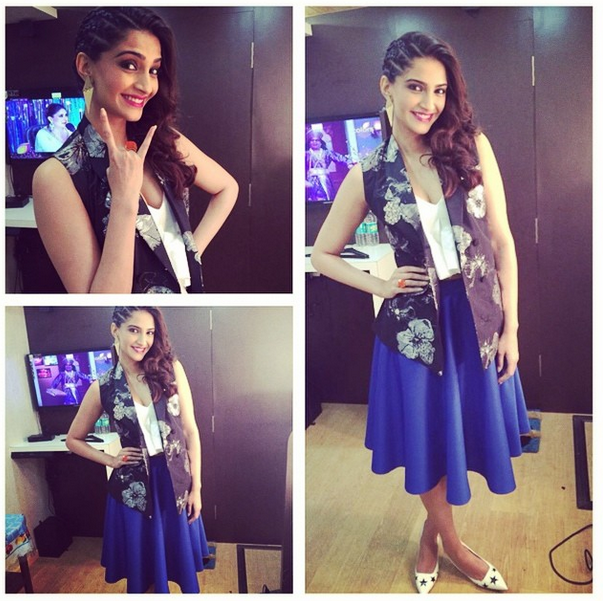 We present to you Top Sonam Kapoor Looks for Khoobsurat promotion. 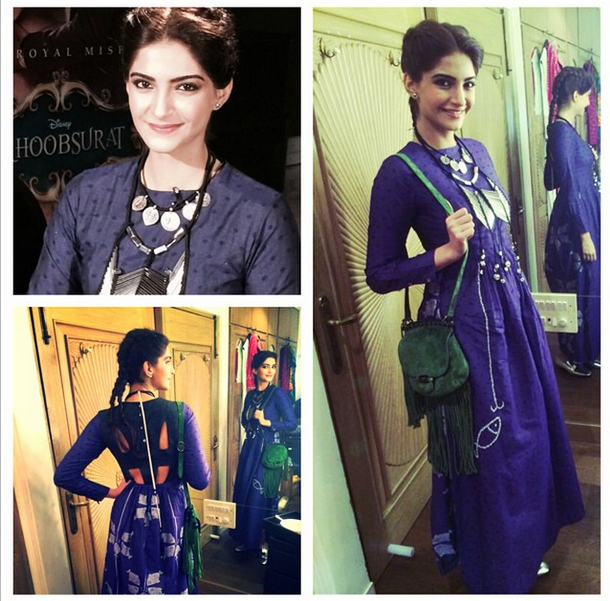 Decoding the style secrets of Sonam Kapoor looks in her upcoming movie Khoobsurat. Look 2: Sonam wears a Stefanel dress with Ferragamo belt and Tods shoes. A vintage purse completes the look. Look 3: Sonam looks stunning in a white Alexander Wang top. She paired it with Navy blue Asos skirt and a floral Pratap jacket. 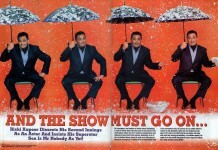 Dolce & Gabbana shoes complete the look! Look 4: Sonam dazzles in a pink-white striped Zara top and a skirt designed by Nisha Sainani. She paired them with hot River Island shoes. 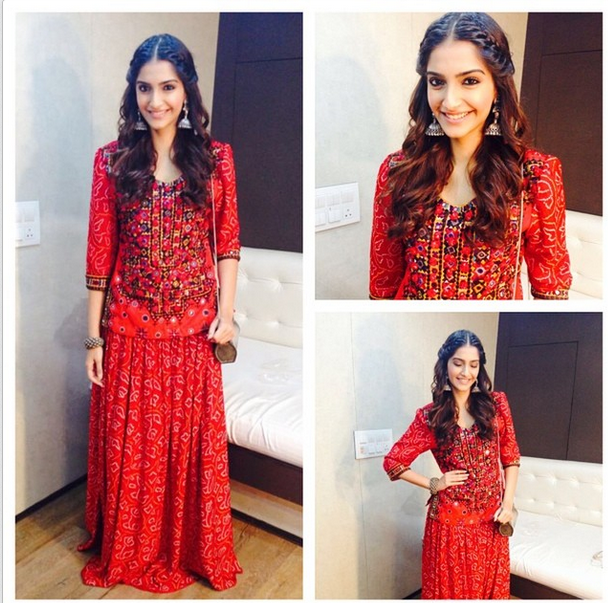 Look 5: Sonam wears a vintage red dress designed by her mom under the label Amaya. Look 6: Sonam dons a White River Island shirt which she teams up with striped Sonal Kalra Ahuja skirt and Pankaj & Nidhi jacket. Ferragamo bag and shoes complete the look. Look 9: Sonam in a lacy dress designed by Sonal Kalra Ahuja with a Dior bag. Look 10: Sonam wears a crop top and matching skirt-designed by Payal Singhal. Silver Cuffs goes well with her dress. Look 11: Sonam in a nerdy avatar wearing a Prabal Gurung short dress and a Dior bag. Look 12: Sonam Kapoor in a navy blue long dress designed by Debashri Samanta. Todds shoes and dark green sling complete her look. 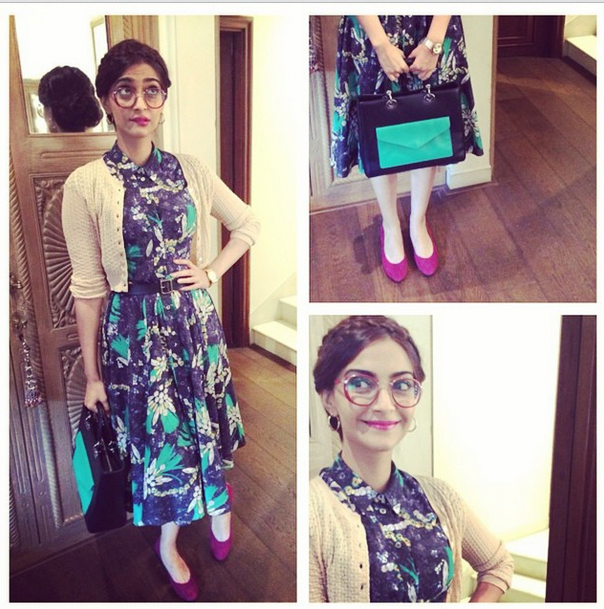 Look 13: Sonam in another nerdy avatar with Dolce & Gabbana floral blue dress, Todds shoes and Dior bag. 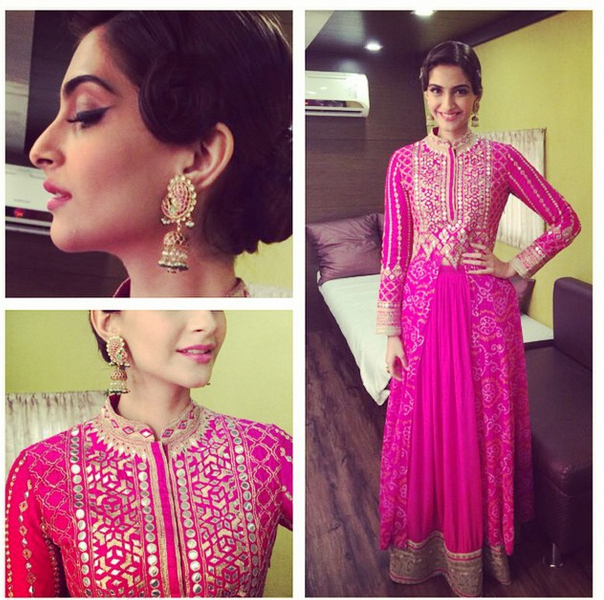 Look 14: Sonam in a hot pink Anita Dongre traditional outfit. 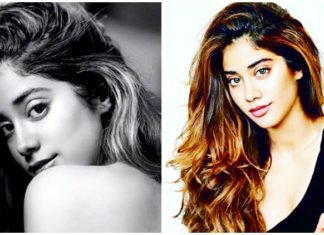 Isn’t she rightfully the Fashionista of Bollywood? Yes she is! 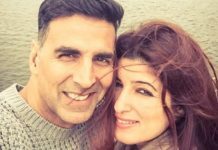 She looks Khoobsurat in every outfit she wears. 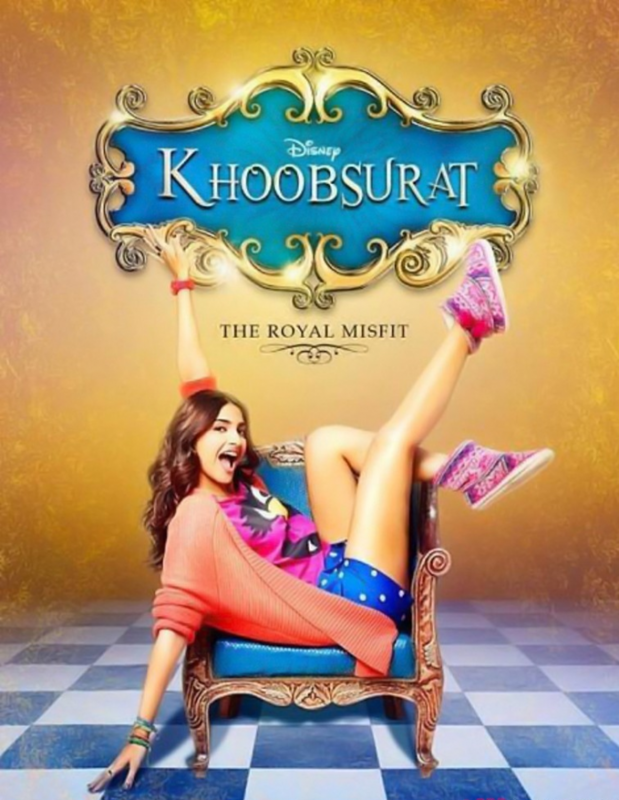 Khoobsurat is Sonam’s upcoming film co-starring Pakistani hunk Fawad Khan, Ratna Pathak and Kirron Kher. Directed by Shashanka Ghosh, Khoobsurat is all slated to release on 19th Sept, 2014.